Click image to enlarge Mayer State Park, Oregon. 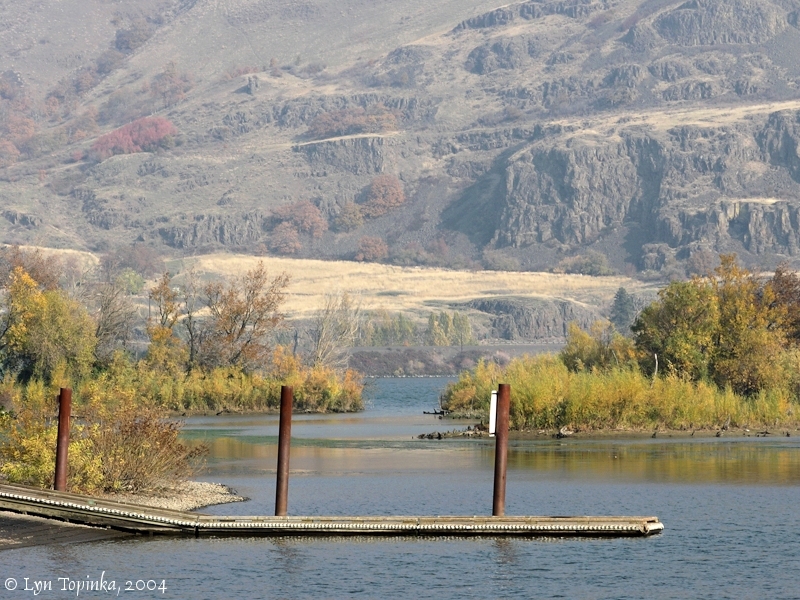 View towards boat ramp at Mayer State Park, Oregon. Rowena Crest is in the background. Image taken November 11, 2004. 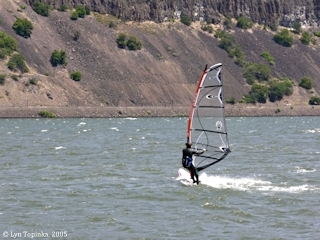 Mayer State Park is located on the Oregon side of the Columbia River at approximately River Mile (RM) 183. 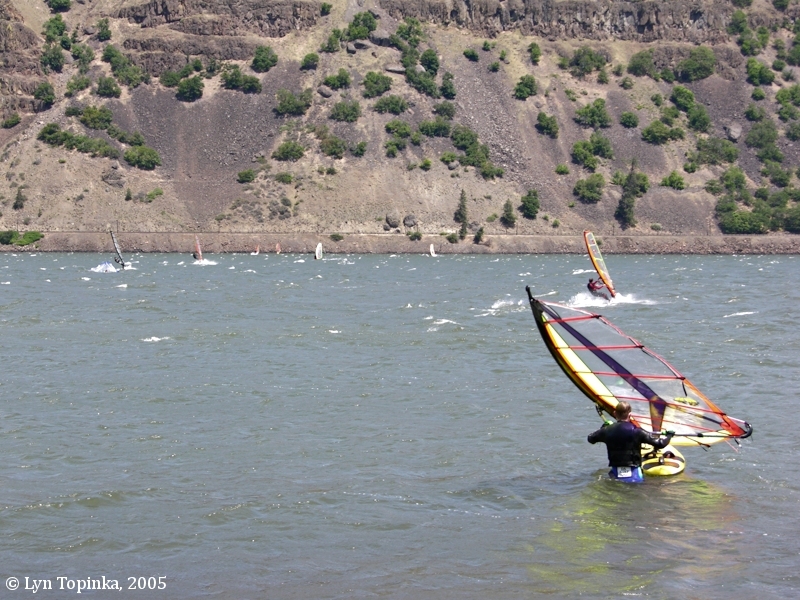 Upstream is The Dalles, Oregon and downstream is Hood River, Oregon. 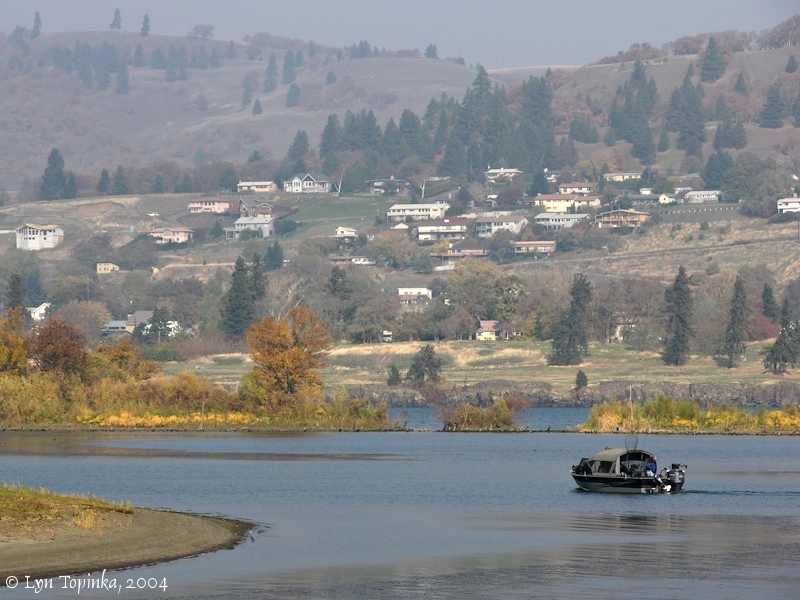 Across the Columbia River on the Washington side lies the community of Lyle along with the mouth of the Klickitat River. 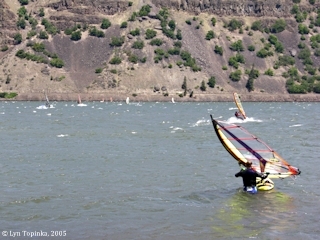 Upstream on the Washington side is the surfing spot Dougs Beach. 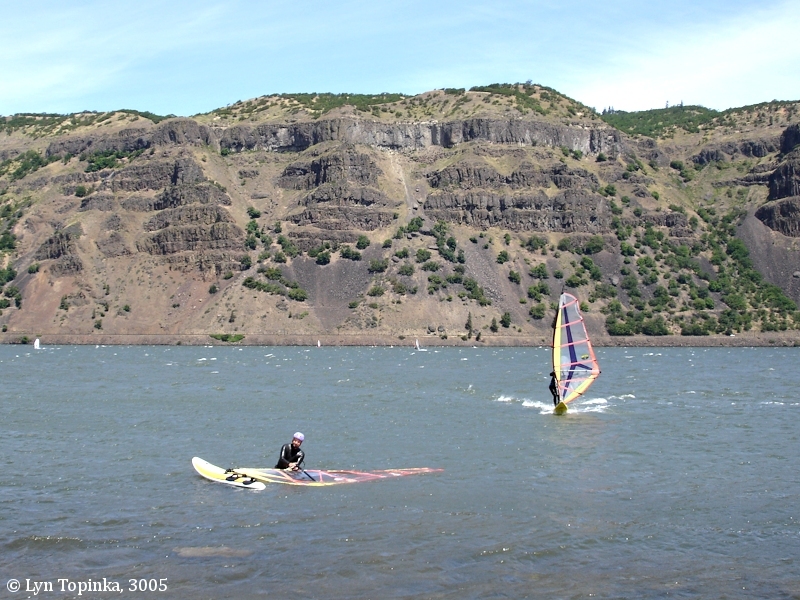 Mayer State Park includes acreage along the Columbia and up on the basalt cliffs, Rowena Crest and the Tom McCall Nature Preserve. 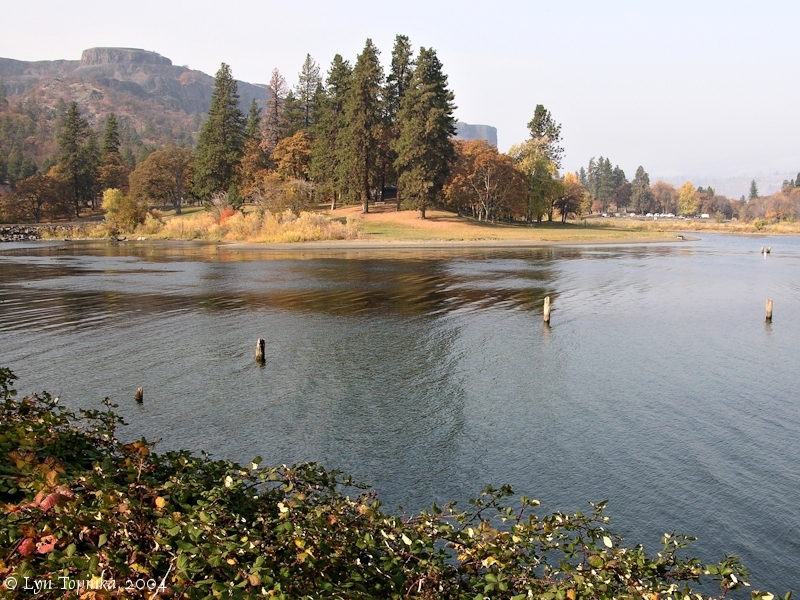 The land for Mayer State Park was donated to Wasco County by Mark Mayer, who in 1910 built a mansion and orchard in Mosier known as the "Mayerdale Place". 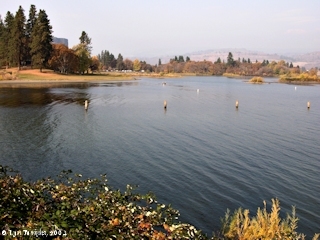 Mayer State Park is part of an area known as Rowena Heights. 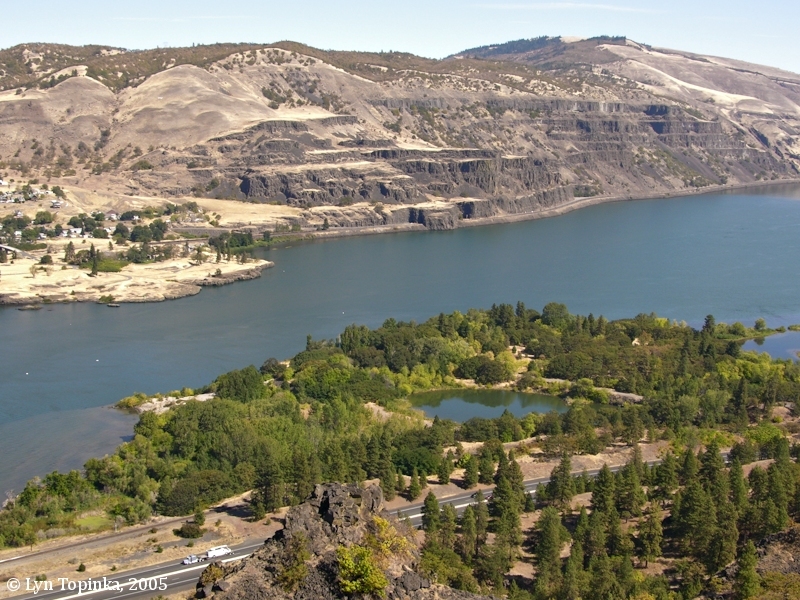 It is located on Interstate Highway 80N, approximately 10 miles west of the city of The Dalles in Wasco County. 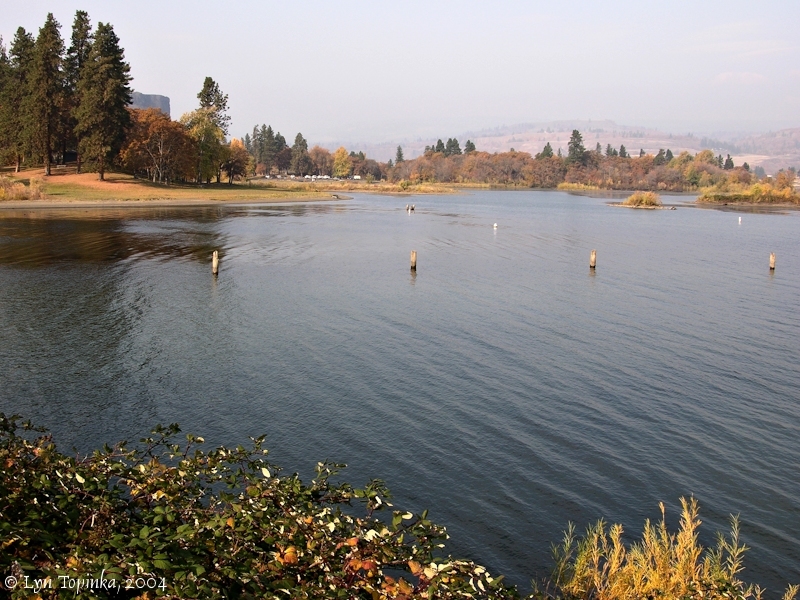 The first land acquired for Mayer Park was 260 acres given to the state by Mark A. Mayer in April, 1924. Negotiations were started as early as 1921 by Mr. Mayer to purchase land to be donated to the state for use as a park. He had difficulty in obtaining a part of the land he had selected, as the owner was holding out for an exorbitantly fantastic price, he claimed. However, late in 1921 the Highway Commission sanctioned a proposal of a condemnation suit through the Wasco County Court, which followed and favored Mr. Mayer. This culminated a very unusual transaction in order to enable Mr. Mayer to donate 260 acres of land to the state for park use. There have been other acquisitions of small acreages for this park, such as two areas totaling 8.3 acres located on the north side of the railroad in 1952 and 1956 at a total cost of $2,872, and another 40-acre tract in 1961 at a cost of $26,570. These transactions brought the total area to 308.30 acres as of the close of 1963. In general, the area is quite rough with a great difference in elevation between the land near the river and that on top of Rowena Point. The cover is scattered ponderosa pine and oak with indigenous brush as an undercover. 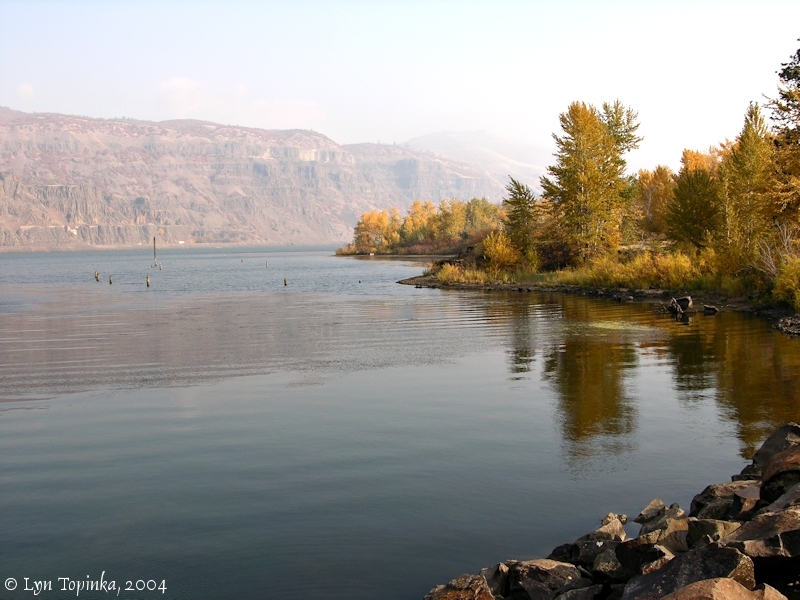 The park development is located on an arm of Bonneville Lake north of the Union Pacific Railroad Company track. It consists of a swimming area, boat ramp 40 x 55 feet, picnic tables, stoves, sanitary facilities and water. Entrance is via Lyle Ferry Road. Day use at Mayer in 1963 totaled 74,728 visitors. Overnight camping facilities have not been provided." Click image to enlarge Columbia River upstream from Rowena, Oregon. 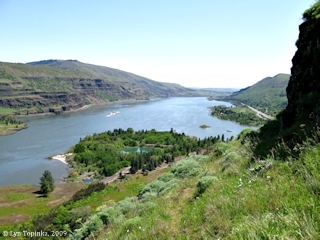 Mayer State Park, Oregon, is along the river in the foreground. Image taken May 9, 2009. Click image to enlarge Fall colors at Mayer State Park, Oregon. Washington State and the Rowena Gap basalts are in the background. Image taken November 11, 2004. Click image to enlarge Mayer State Park, Oregon, boat dock. Looking towards Washington State and the Rowena Gap basalts. Image taken November 11, 2004. Click image to enlarge Rowena Crest from Mayer State Park, Oregon. Image taken November 11, 2004. The upper part of Mayer State Park which includes Rowena Crest and Tom McCall Nature Preserve is located on a basalt mesa which was stripped clean during the last ice age by the Missoula Floods. This surface was then covered by 3-4 feet of loess which eventually eroded into the mounds which dot the surface of the basalt flow. 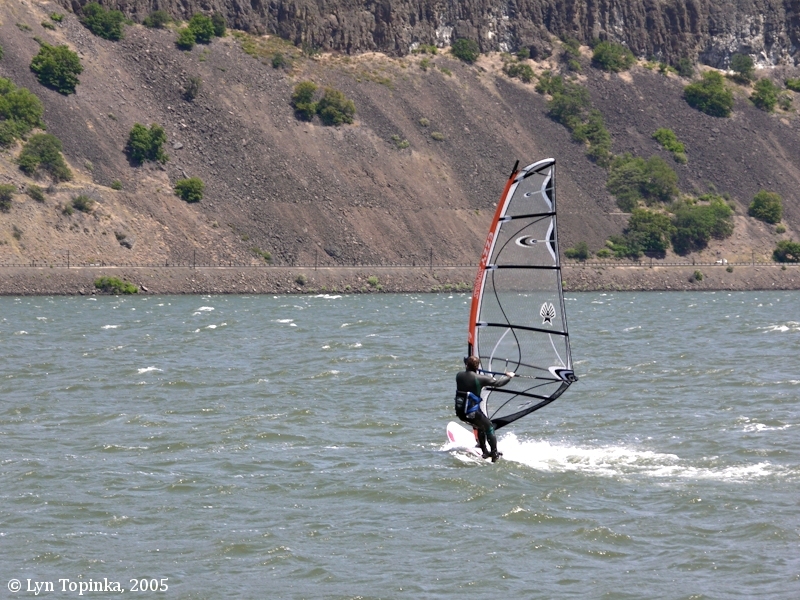 The Columbia River Gorge and the Bonneville Reservoir have become one of the world's leading windsurfing and sailboarding areas. 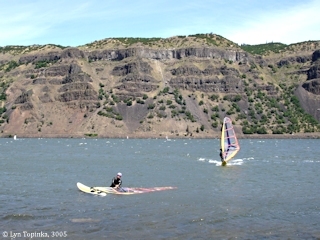 Mayer State Park and Dougs Beach across the river are two popular areas. 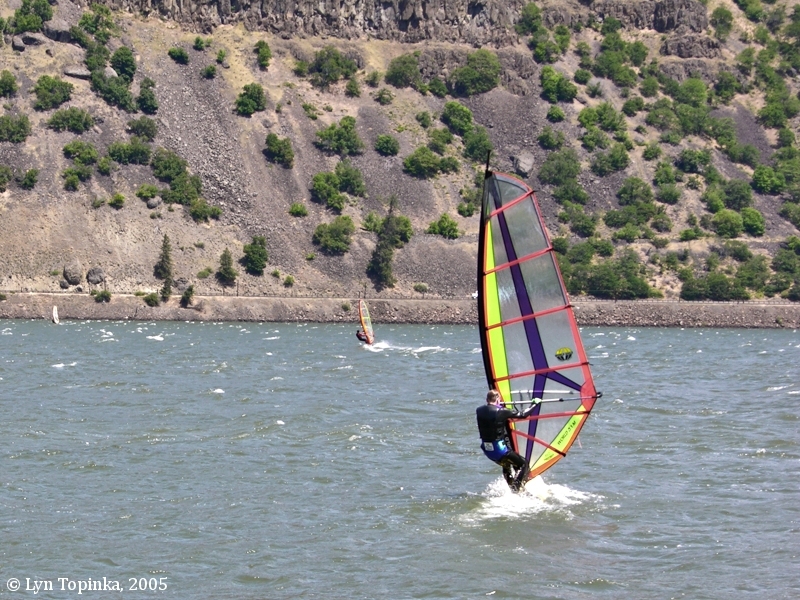 Kite boarding has also become popular during the recent years with Hood River, Oregon becoming a favorite location. 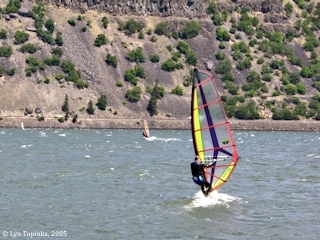 Click image to enlarge Sailboarding, from Mayer State Park, Oregon. Image taken June 4, 2005. 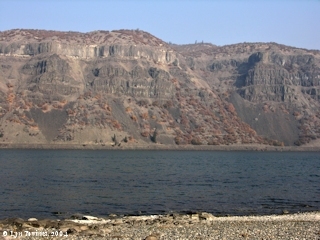 Click image to enlarge Basalts of Rowena Gap, Washington, from Mayer State Park, Oregon. Image taken November 11, 2004. 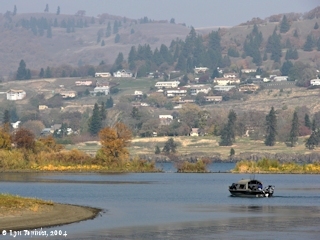 Click image to enlarge Lyle, Washington, from Mayer State Park, Oregon. Image taken November 11, 2004. Penny Postcard: Mayer State Park, Rowena Heights, Columbia River, ca.1920. Penny Postcard, ca.1920, "Mayer Park on Rowena Heights, Columbia River Highway near The Dalles, Oregon.". Published by Wesley Andrews, Inc., Portland, Oregon. Card #827. In the private collection of Lyn Topinka. Penny Postcard: Mayer State Park, Rowena Heights, Columbia River, ca.1920. Penny Postcard, ca.1920, "Mayer Park, Rowena Heights, On Columbia River Highway". Photo by A.M. Prentiss. Published by Rose City News Co., Portland, Oregon. Card #24. In the private collection of Lyn Topinka.